Mike Morheim steps down as President of Blizzard Entertainment. Replaced by J. Allen Brack, the now former World of Warcraft Executive Producer. Also announced is that Ray Gresko will be taking over as Chief Development Officer and Allen Adham, who co-founded Blizzard with Mike Morheim, will be joining the Executive leadership team. Choose Your Champion returns for the Fall Championship. Go over to the Choose Your Champion site, and pick one. You get 1 free pack just for choosing a champion. At most you can earn 4 free packs. Voting ends on Oct 11th. Cards will be delivered a week after the Fall Championship. (Oct 11-Oct 14). Speaking of champions, Thijs wins the EU vs CN 2018 Championships. He won an Aston Martin DB11! BlizzCon is 4 weeks away! Blizzard has released the full schedule and it leads to some interesting information. After the Opening Ceremony, the next major conversation is Diablo: What’s Next. Then Overwatch, Hearthstone, World of Warcraft and Heroes of the Storm. New keyword – Casts When Drawn. Added to the following cards, Nerubian Ambush!, Burrowing Mine, Bomb, Ancient Curse, Spider Ambush!, Scroll of Wonder, Darkness Candle. New Welcome Bundle available now – $4.99. 10 Classic Packs and 1 random Classic Dragon Legendary. Vast: Ysera. Opened my packs and also got Baron Geddon. Also 2 golden cards! A golden Witch’s Cauldron is being given out for logging in during Hallow’s Eve. The new player ranks are live. Rank 50 to 26 are for new players only. Can earn a total of 22 free packs just by ranking up in New Player ranks. Earn 3 free Classic card packs by reaching milestones at 45, 40, 35 and 30. And when you get to 25, you earn 2 Classic packs and 2 packs of each of the most recent four Hearthstone expansions. Players can skip the New Player ranks, however they miss out on the rewards. Players unlock Wild Format and Casual mode by getting to rank 25. As before, Tavern Brawls unlock after getting level 20 with any Class. Choose any class, expect Webspinners. 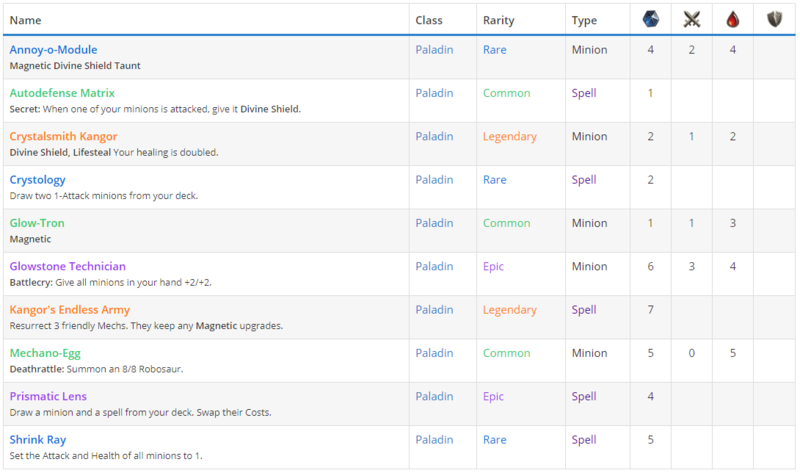 Your deck will contain 7 spells from your chosen class and 23 Webspinner. Winning the Brawl comes down to RNG, so good luck! I have found a new love in @PlayHearthstone with OTK Paladin. So much, that I crafted him in Golden! That’s my 5th Hero Card in Golden, now. (Uther, Jaina, Gul’dan, Hagatha and Dr Boom) @XcMtbGamer I think @LotiPodcast has brought me over to the Golden Darkside.